A sleeper sofa is a fantastic space saving and economical piece of furniture and an ideal choice for many people. It combines two pieces of furniture into one: a sofa and a fold-up or hideaway bed. It can be an additional bed for overnight guests. And during day time it provides comfort, seating and adds to the overall decor of your room. However, when it comes to sleeper sofas, trying to find the right one can be quite a challenge. Some sleeper sofa beds can be bulky, and rather difficult to fit into tight spaces. 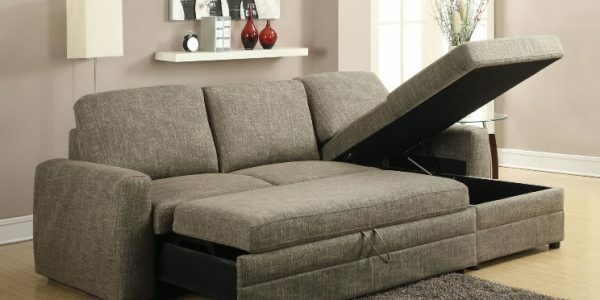 When you are trying to fit a sleeper sofa into a tight space, the problem becomes even tougher. Regardless of your decor or budget, if you’ve got floor space, you’ll have extra seating and sleeping space in one clever piece of furniture. But before you grab one of the many contemporary sleepers sofas on the market, here are some things you have to bear in mind. In a hurry? Give house guests a comfortable place to rest with the Ashley Signature Design Lottie sleeper sofa bed. 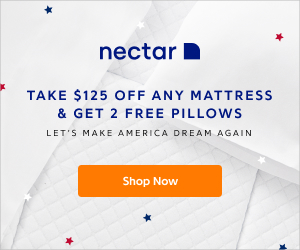 With a classic design and covered in high-performing Durablend, it comes in a variety of neutral color options and with a premium full-size, queen or twin memory foam mattress sleeper which is extremely comfortable and pleasant to sleep on. So, how do you get to choose the right sofa bed or sleeper sofa for your home? Here is a detailed guide to follow. This is what makes up the base of the sofa bed. Frames come in different materials and densities including metal and hardwood. Hardwood frames are preferred because they are more durable and stable as time goes by. 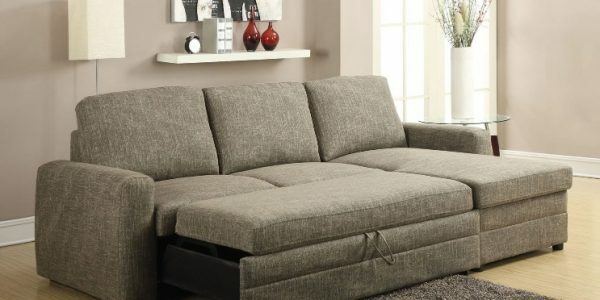 A sofa bed functions in different forms so it is only right to get one with a frame that can withstand wear and tear from switching the modes. In addition to the frame, the mattress determines the durability feature of the sofa bed you choose. 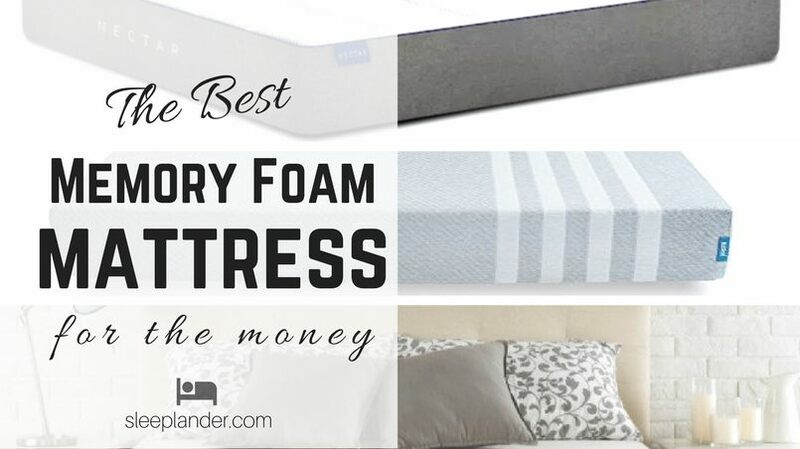 There are different types of mattresses for sofa beds including spring, memory foam and air coil. Spring mattresses have a firm feel with flexible support and are considered excellent for sofa beds. 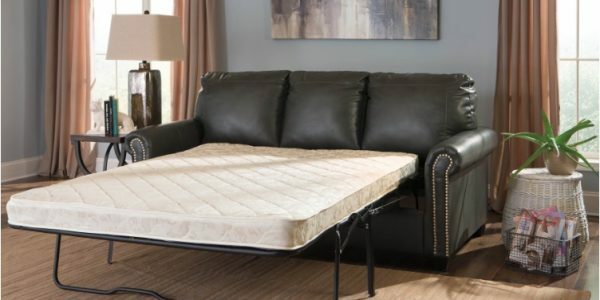 Memory foam mattresses on the other hand are excellent for contouring and conforming to the body shape for pressure relief or back/hip pain relief. On this note, memory foam is suitable for people with multiple sleeping positions and those that intend on using the sofa bed frequently. Air coil mattresses combine the innerspring technology with the spring support for better support. It also works as fine, but the selection depends on personal preference and the feel you like. This factor depends on how you intend to use the sofa bed. For instance, if you want to use the sofa bed each day, then you ought to find a large one that can be comfortable each day. On the other hand, the space available will dictate the size. Another determinant is the shape which again works closely with the area and layout of the room. 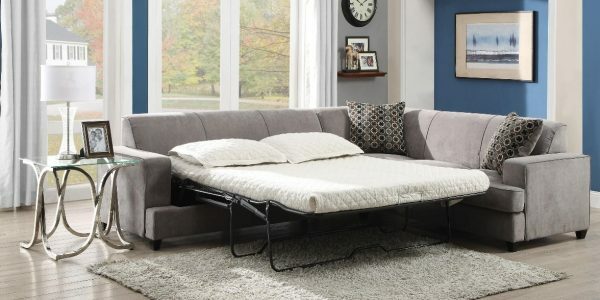 Are you getting the sofa bed for daily or occasional use? This is one crucial factor to keep in mind when selecting a sleeper for your house. If you have guests visiting every other time, then you might need to get a large sofa bed. It will serve as a large couch as you chat and transform to a sizeable bed surface for the night. Like any other furniture piece, sofa beds come with different price tags. 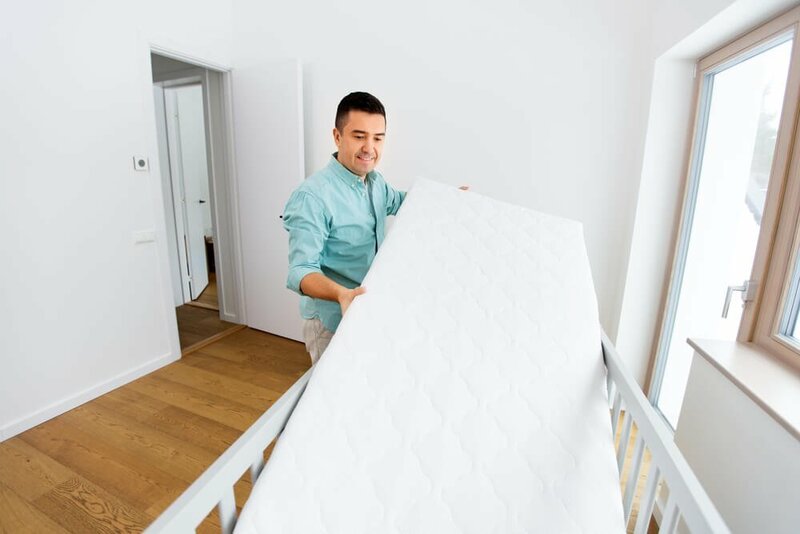 It all depends on the type of material, the mattress, frame, and size. Also, the operating mechanism determines how much you will pay to get the sleeper. When choosing a suitable one, it is essential to look from a quality point of view rather than the cost. Also, low priced sleepers do not necessarily mean low quality. Sofa beds come in different styles which require different installation procedures depending on the make. The lift and pull mechanism is one of the most common types where you lift the back up to release the lock and slide it down to form the bed. The other design is the folding one which mainly comes in memory foam or innerspring mattress. The clic-clac mechanism only needs you to push the back forward to release the locking system. This then folds the rear to level the surface of the seat forming a bed. The other type uses a cantilever system which works by pulling the lower front panel to unfold. It then creates a flat surface which can fold back by pulling the back side. Why You’ll Love it: An elegant sofa that will beautifully decorate your living room, the Ashley Lottie Sleeper Sofa has superior upholstery that is both durable and comfortable and comes at amazing price tag. Add extra seating and a place for guests to sleep with the Ashley Signature Design Lottie Sleeper Sofa. The sofa offers streamlined comfort and a concealed memory foam mattress. The Lottie sofa sleeper has a traditional classic look and curves you love in a couch covered in high-performing DuraBlend for the look of leather but without the maintenance or cost. This is a great option if you have pets or small children and are looking an affordable, low-maintenance yet stylish sleeper sofa. It features stylish rolled arms adorned with nail-head accents. The cushions feature high-resiliency foam wrapped in a thick layer of poly fiber. When you want to call it a night, simply pull out the full memory foam mattress and sleep dreamily. The Lottie sofa also comes in a sofa bed queen, twin and full size model and is available in three neutral colors: slate, almond or chocolate. Ashley Signature Design has more affordable and stylish sofas on Amazon which are all reasonably priced, so if you don’t like this one, you can browse other sofa designs here . The sofa has a thick cushion armrest with a nail head detail all the way down to the front legs. Seats and back spring rails are cut from 7/8 hardwood and the pull out feature has an easy mechanism to operate. All fabrics are pre-approved for wearability and durability against AHFA standards and the cushion covers are made of low melt fiber wrapped over high quality foam. Cons: Delivery may be a little slow. Why You’ll Love it: This sleeper sofa oozes rustic style and would look great in your living room, cabin or mountain lodge. 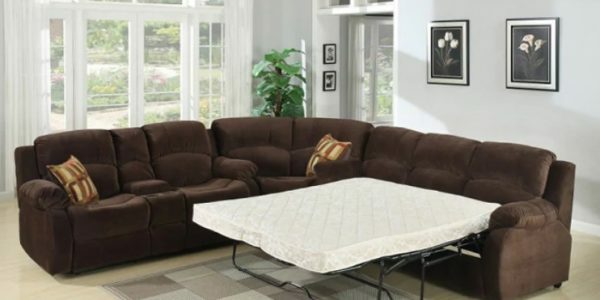 This queen sleeper sofa is made with comfortable foam seats, brown leather, a solid wood frame and a queen pullout mattress making this a wise long-term investment turning your room into a mountain lodge. 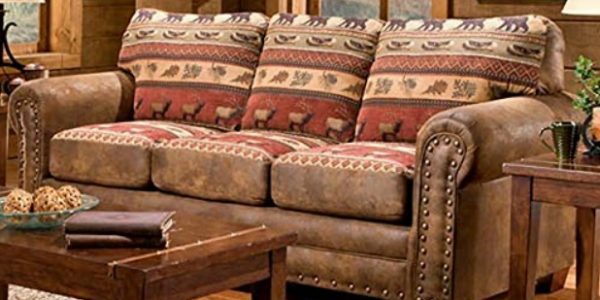 If you’re looking for a Southwestern style in your sleeper sofa, the Sierra Mountain sleeper sofa provides a pleasing look with a rustic vibe. With brown leather-look microfiber and cotton print, this unique rustic sleeper sofa looks like it should cost quite a bit more than it does. The supportive cushions and the back are wrapped with a layer of fiber delivering a comfortable surface to rest after a long day at work. The cushions are made of high-density foam, giving you the required support for your back. This sleeper sofa provides a comfortable seating position, and it easily converts into a bed with the Legett and Platt mechanism and inner spring and with a quilted top queen mattress. The pull out for the mattress is easy so that’s another nice added feature. The design and style of the sofa are beautiful with the harmony each detail brings. The arms have a finishing detail using nailhead accents for a trendy look. The earthy color is perfect for any room space and matches pretty well with different themes. More to the design, the couch has robust and stable wood legs to keep it stable and balanced. 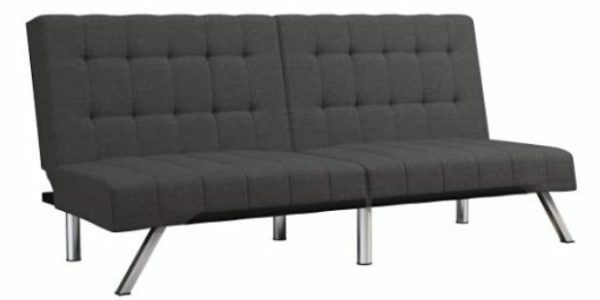 Dimensions wise, the arm height (without legs) measures 24 inches and overall this sofa bed measures 37 inches high x 88 inches wide x 31.5 inches deep. 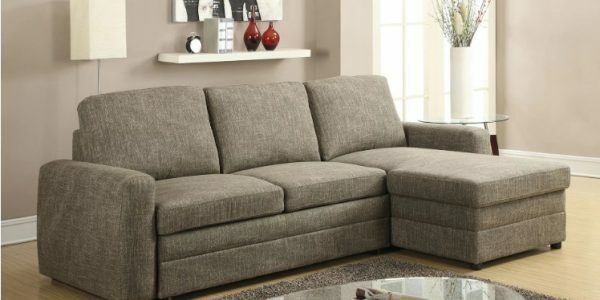 If you’re looking for a unique design, that is sturdy and beautiful, you won’t go wrong the multi-function Mountain Sierra Sleeper Sofa Couch. Pros: Stylish look, high-quality fabric, solid wood frame, firm cushions, back cushions are removable. Why You’ll Love it: This is the perfect-sized Couch Futon Sofa Sleeper for a studio or a small apartment that is both comfy and chic. If you’re on a budget but still want something stylish, the Emily Futon is great value for money. If you are after a minimalist look or a Zen-like sleeper sofa, then this the choice for you. It has a sleek, polished design that will not only spice up your space but also provide the much-needed comfort of a proper bed. One thing you will enjoy is the split back design which offers different positions for optimal comfort. 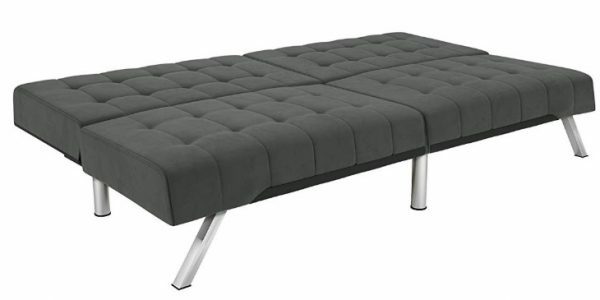 The sofa bed comes in a modern low profile design with polished metal chrome legs and foam upholstery fill. For comfort, the sofa features tufted backrests and cushions which are full and stay firm even through excessive daily use. The Emily Futon is available in burgundy velvet, gray velvet and tan velvet. The Emily Convertible Futon features a click clack technology that enables the futon to convert easily and quickly from sofa to a full-size mattress bed. The materials used to make this couch bed include metal, wood, velvet, and foam. These together deliver a sofa you can be sure will last long while providing comfort and high functionality. On this note, this multi-functional sofa is ideal for people with limited floor space. 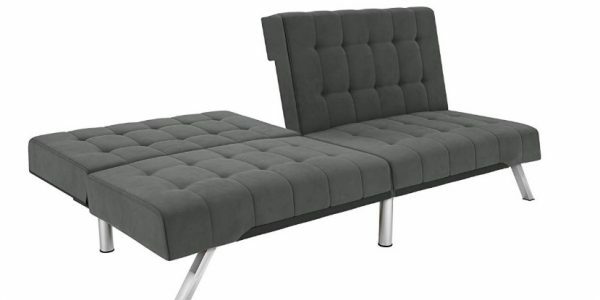 The Emily Split Back Futon is quite versatile and you can recline a portion of the back for comfort. Alternatively, you can lower the back completely to transform the chair into a sleeper for more sleeping area. Overall, there are 3 positions for the back to support different activities.The process of converting is simple, and in a snap, you have your bed ready for rest. It ships broken down in a rectangular box, but there aren’t many parts to it and the assembly instructions are definitely clear. Why You’ll Love it: The multi-functional Derwyn L Shape Sleeper Sofa offers numerous features including a Right facing chaise lounge with storage function and a Left facing Loveseat with a hidden pull-out bed. When space is a problem in your home, instead of looking for multiple pieces of furniture, look for multi-functional furnishings. This is what you get with the Derwyn Sectional Sofa with Pull-Out Bed. The sofa bed comes in a light brown linen and features puffy cushions and loose back cushions for comfort. It is pretty big and can sit at most five individuals. The right-facing chaise lounge has a space under that is meant for storage of extra items around the house. It works by pulling it up to open the storage and flipping it back to cover. 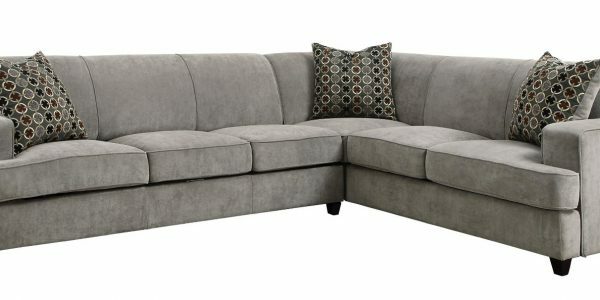 The left facing loveseat has a hidden pull-out which is easy to install. You only need to pull the section to convert the sofa into a larger sleeping surface. This feature makes the couch suitable for limited space or when you need extra sleeping space for guests. The uniform armrests complete the sofa’s style making it stylish and contemporary. It comes in a neutral color to easily fit any decor. It’s a simple, classic sofa that should go well in just about any room and it’s sized to function as a bed and a couch and still deliver comfort. Why You’ll Love it: The huge and comfortable Tess Sectional Sofa for Corners offers numerous configuration options to fit many different room sizes. 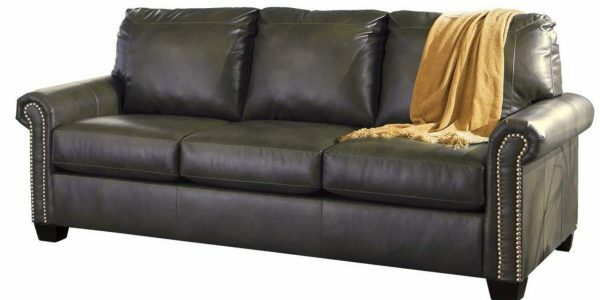 This sectional sofa with sleeper mattress is great value and works perfectly for large spaces. It features a clean style that will make your living room feel and look modern. 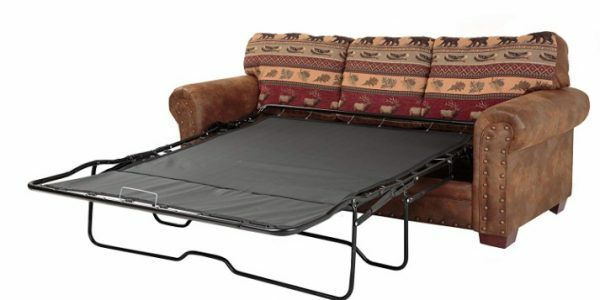 It comes with a hidden sleeper mattress that converts the couch into a large bed surface for extra sleeping space. Push this sleeper sofa in a corner or arrange it for room separation, either way it will make a very comfortable hang-out area. 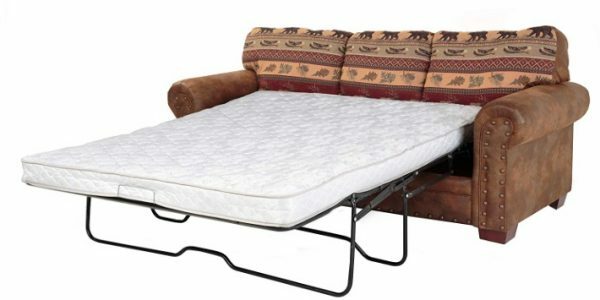 This pullout sofa bed offers good sitting support made possible using thick track arms and foam with a density of 1.7 (lbs/inch3). The sofa can hold up to eight people and can pull out to form a queen-size sleeper mattress bed. With this, you can rest assured your guests stay and sleep comfortably all through. 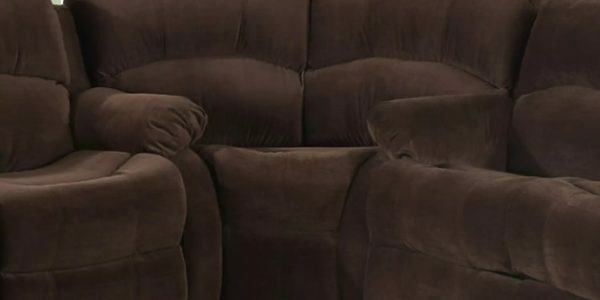 When it comes to the general quality of the sofa, this one is unbeatable. It features a frame made of kiln-dried hardwood to last a long time providing stability and support. The seat cushions are removable allowing for easier cleaning while the back cushions remain in place. The color is neutral-gray, so the sofa should easily match your existing décor. Pros: Comfortable, large sitting area, easy to pull out, neutral color, quality frame, seat cushions are removable. Why You’ll Love it: Add elegance to your living room decor with this soft and distinguished reclining love seat and sleeper couch that comes with a comfortable pull out mattress with the Tracey Sleeper Sectional Sofa Bed. Luxury and style go hand in hand, and this is precisely what you get with this 3-piece modular sofa sleeper from Christies Home Living that is covered in a chocolate brown fabric that has a twill finish. You will feel relaxed in its soft supportive embrace and the durability of the fabrics used are tough enough for years of serious couching. 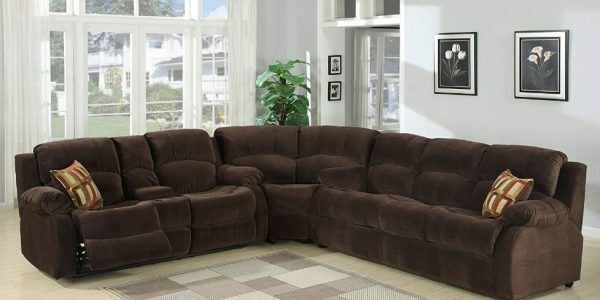 The three piece sofa includes 1 recliner sofa bed/loveseat and 2 seat recliners. The recliner sofa bed comfortably sits 6 poeple and is perfect for long-term sitting, TV viewing and relaxed reclining in your home theater or living room. It also features a storage console that allows you to keep things conveniently close at hand but out of sight and 2 cup holders. The 2 recliner seats have arm rests and features a storage console to hide your favorite devices, cup holders to keep track of your favorite drinks and a pull out bed. When it comes to the seat and back cushions, the sofa combines the support of encased pocket coils with the comfort of Dacron fiber. The top is covered with high-quality polyester fabric for easy maintenance and comfort. 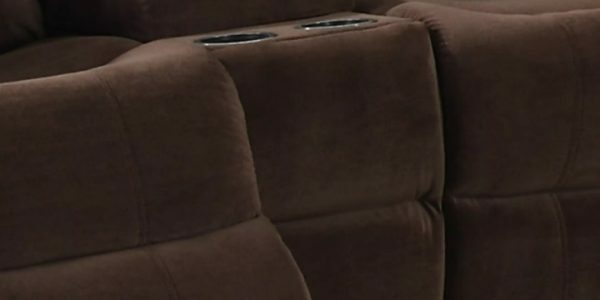 The sofa has four recliners that are designed to take different positions for comfort. Each motion is independent and does not affect the other when switching them up. A pull latch is provided under the arm cushion where you can hold it and move it to the position you wish. The polyester sofa has curved armrests for comfort and relaxation. The double reclining love seat comes with a console that can be used as extra storage space for items around the home. It takes up little space and therefore suitable for squeezed areas. With this, you get to enjoy comfort, functionality, and flexibility in one place. It is clear that choosing a sofa bed take much more than considering the design and size. Other factors such as the recliner bars, the construction, and the converting process play a crucial role in ensuring comfort and functionality. With these top picks on sleeper sofa beds, you can get a suitable one for the type of space you have. Bottom Line… We recommend the Ashley Signature Design Lottie sleeper sofa bed for a comfortable night’s sleep for your guests. To support our work we earn a commission if you buy through some of the links listed below at no additional cost to you. This doesn’t influence our opinions, but we believe in full disclosure so you can make informed decisions. Read more here .